Fayetteville HVAC | Day & Night Heating & Air Conditioning Co.
Day & Night Heating & Air Conditioning Co. is available for all your heating and cooling needs. Saturday appointments are available at no additional cost! For reliable and affordable heating and cooling services in Fayetteville, call Day & Night Heating & Air Conditioning Co.! We’re available whether you need a repair, maintenance, a replacement or a new installation for your AC or heater system. We offer extended hours, Saturday appointments and don't have overtime rates. Our team proudly serves residential and commercial property owners throughout the Cumberland County area. Day & Night Heating & Air Conditioning Co. is committed to delivering stellar HVAC assistance with the highest level of professionalism. Having served the community for over three decades (and still counting! ), we go above and beyond to provide 100% customer satisfaction on every job. Have heating and cooling needs in Fayetteville? Schedule your service with Day & Night Heating & Air Conditioning Co. by calling (910) 933-2338. Providing Excellent Service When You Need Us! Day & Night Heating & Air Conditioning Co. is the area's first choice for premier heating and cooling services. Our reliable technicians are always ready to report for duty when you need HVAC assistance, no matter the day, the hour, or the time of the year! Don't hesitate to call us when you have repair, replacement, maintenance or new installation needs. Keeping you comfortable is our #1 goal. Everyone likes to save money when it comes time to repair or replace the heating and cooling system in their Fayetteville area home. Why We're the Area's #1 HVAC Pros? Family owned and operated since 1979. We are proud to live and serve in the community. We arrive on-time and in most cases we can fix it in one visit with our fully stocked vehicles. We offer a variety of special financing options with approved credit that help you buy now and pay over time. We provide after hours emergency service in the evening or weekends, outside of normal working hours. No surprises. Know the costs before you approve the repair with our Expert. We stand behind all of our repairs. We let you choose your repair level and associated warranty coverage. We send you an e-mail with a picture of the expert so you know who is coming to your home ahead of time. We deliver top-Notch service & have more positive reviews than any other Trane dealer in the area. At Day & Night Heating & Air Conditioning Co., your comfort is our business and our top priority. There’s no room for us to cut corners with the superior workmanship and top-quality service we provide. Our team is available for after-hour and emergency HVAC requests. You can count on us to respond promptly once you enlist our services. You name it, our trained and certified technicians can service it! We can fix, replace, or install any HVAC equipment make or model. 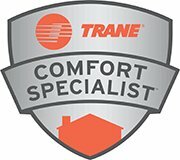 As proud Trane® Dealers, we also supply the best-performing heating and cooling systems that’ll keep the indoor climate of your home or business at the perfect temperature year-round. Our team stays ahead of the curve with new advancements in the HVAC industry, ensuring that our customers receive effective solutions that can help them save green in the long-run, satisfy their comfort all year, and secure better-quality air for their property. Keeping you comfortable year-round is our #1 priority.